April 18, 2010 – U.S. President Barack Obama unveiled proposed changes to the administration's fiscal year 2011 budget submission for space exploration, including a crew rescue vehicle and a decision on a heavy-lift rocket in 2015, at NASA's Kennedy Space Center on Thursday. The Boeing Company responded today with the following statement. 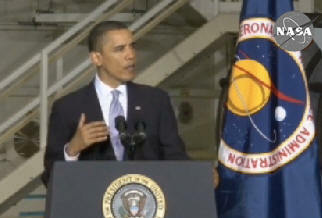 "The president's enthusiasm for space exploration was encouraging. We are pleased that the president remains committed to human spaceflight. We remain convinced that America stands at an inflection point with regard to space. If we make the right decisions today, we have the opportunity to create a new Golden Age of Space. Our national leadership's focus on this bodes well for our country and its highly experienced space industrial base. "We are encouraged by the extension of the International Space Station program and look forward to enhancing scientific research onboard, upgrading the space station, and using it as a U.S. national laboratory. “Benefits to be gained from extension of the space station include international cooperation; medical and pharmaceutical advancements; its use as a test bed for demonstrating Earth-observation capabilities and future exploration technologies; and the availability of a waypoint for future exploration missions. ‎"A bold national space program also supports the United States' security and economy by fostering a domestic work force that is educated and skilled in science, technology, engineering and math. It encourages the growth of new technologies and emerging businesses, large and small. "We support the president's call for increased investment in heavy-lift launch vehicle technology, but we believe the United States should be on a clear path to accelerate the development and production of this critical system, along with a deep-space capsule. Both of these vehicles are essential to any deep-space exploration mission. “We have the technology and the people to commence development of these vehicles now. A plan that includes a heavy-lift vehicle would enable space exploration supported by humans, large-array telescopes and deep-space robotic missions. It could achieve maximum benefit from American tax dollars by drawing on the cutting-edge technology already being developed for the Constellation program.